Deluxe Skeleton Chair Cover.Includes: One Deluxe Skeleton Chair Cover. Available Size: One Size Fits Most 32"- 43" Chairs. *Costume and Accessories Not Included. Sold Separately. Features one cover that will fit most 32"- 43" chairs and is made of a nylon blend. 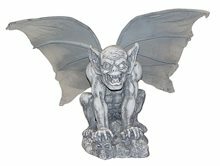 Posable Gargoyle Prop.Includes: One Posable Gargoyle Prop. Dimensions: Approximately 10'' X 12.5''. *Props and Other Accessories Not Included. Sold Separately. Known for protecting their surroundings, you'll want to keep alot of them around your house to protect you from all that is evil this Halloween. Gothic Gargoyle measures 10'' X 12.5'' and is made of polyfoam. Spooky Scenes Lamp Shade Cover;Transform an ordinary lamp into a spooky Halloween scene. Adjustable to fit lampshades up to 16" diameter and 10" high. 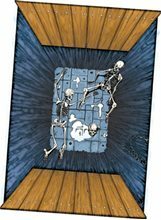 Spooky Scenes Floor Mat;This floor mat is made to look like an open trap door with skeletons dwelling at the bottom. Look out or you will join your friends down there. Floor mat gives the look of a deep dungeon hole with skeletons laying around. 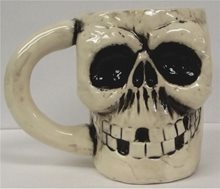 Helps create a spooky, fun environment for your Halloween party or haunted house. Put 'Em Ice Bucket;Talk about Brain Freeze! Not only does it look cool but it is cool. This Put 'Em on Ice Bucket will certainly help set the mood of your next HalloweenParty. 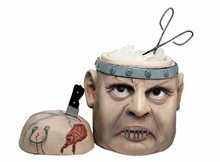 It features a monster head ice bucket. The lid is the top of the monsters head and metal ton gs are included. Devil Pipe.Includes: One smoking pipe with devil face.Dimensions: Approximately 6" long. *Costume and Other Accessories Not Included. Sold Separately. 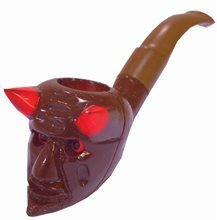 Complete your devil cosume with this devil pipe! The fake smoking pipe resembles a devil face and an attached, plastic steam that is light brown and black (please note the colors vary from the picture). The pipe measures almost 6" long. Also excellent with a devil costume! Bleeding Zombie Bowl.Includes: One Bleeding Zombie Bowl. Available Size: One Size Fits Most Adults and Teens. *Costume and Accessories Not Included. 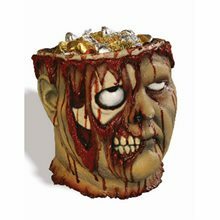 Sold Separately.This terrifying Bleeding Zombie Bowl looks like it came straight from a horror movie and will make anyone think twice before stealing YOUR candy! Makes a great centerpiece in party decor. 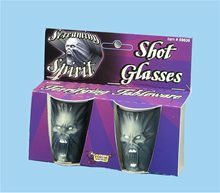 Deluxe Screaming Spirit Shot Glass;Scary relief spirits look as though they are busting out of the tableware accessories in the Screaming Spirit line. Mix and match for a great halloween theme. Made of plastic. Hand wash. Set of two shot glasses, approx 2"H.
Skeleton Bear Trap Candy Dish.Includes: One Skeleton Bear Trap Candy Dish. Dimensions: Approximately 15.5" x 11.5". *Batteries, Candy and Accessories Not Included. Sold Separately. WARNING!! : Not a toy, for decorative purposes only. For ages 8 and over. 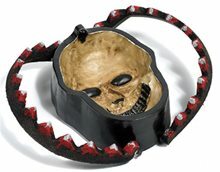 Indoor use only.Complete your Halloween party with this awesome Skeleton Bear Trap Candy Dish with soft foam claws! Required 3 "AA" batteries. Haunted Led Candelabra 14in; Gothic design with skull motif. White candles appear to be dripping blood! LED lights require 3 AAA batteries. Product Size: 14in(H) x7in(L) x4in(W).